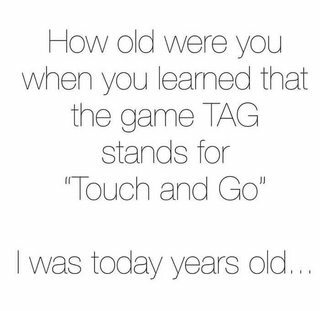 How old were you when you learned that the game TAG stands for "Touch and Go"? A children's game in which one chases the rest, and anyone who is caught then becomes the pursuer. A label attached to someone or something for the purpose of identification or to give other information. since you yell "Tag, you're it" as part of the game. My question is, is there any evidence that tag is an acronym for "Touch and Go"? Is is possible this is technically another game, and not the centuries old children's game? Or is this just another case of "Everything you read on the internet is true. - Abraham Lincoln"
It seems to me that "touch and go" is nothing more than a backronym (Wikipedia). "children's game," 1738 (in reference to "Queen Mary's reign"), perhaps a variation of Scottish tig "touch, tap" (1721), probably an alteration of Middle English tek "touch, tap" (see tick (n.2)). Baseball sense is from 1912. What raised my eyebrow more than that was I was today years old . . . It has to be made up, as the name "tag" is an older name for the game. Tag is likely a corruption from the old english word "tick" from the Germanic/Dutch "tikken" (to touch or pat lightly). Evidence of tick being in usage is documented from around the 16th century. Also, tig, probably a corruption of tick, was around from the 1800's. I only know this as I did a bit of etymology research - where I am from, we still say "tick" and we get told we are wrong! Yet it appears we have a stronger case than tag, tig or it! So in my opinion, Tag is definitely not an acronym for "touch and go". Not the answer you're looking for? Browse other questions tagged etymology acronyms or ask your own question. Usage of touch the wood?